Seth Cooper is an Assistant Professor in the College of Computer and Information Science at Northeastern University and a member of the Playable Innovative Technologies Lab. His research focuses on using video games to solve difficult scientific problems; he has delivered multiple TED talks on the topic. He is co-creator of the scientific discovery games Foldit and Nanocrafter and early math educational games including Refraction and Treefrog Treasure. He has also researched real-time animation for games, and has previously worked at the Center for Game Science (as Creative Director), Square Enix, Electronic Arts, Pixar Animation Studios and the UC Berkeley Space Sciences Laboratory (on BOINC, the Berkeley Open Infrastructure for Network Computing). Rather than solving problems with a purely computational approach, combining humans and computers can provide a means for solving problems neither could solve alone. Video games provide a compelling framework for this approach: they are a natural space for problem solving and can foster the engagement necessary for people to make a contribution. Cooper will describe the challenges of mapping real-world problems onto games and ways to address these challenges. 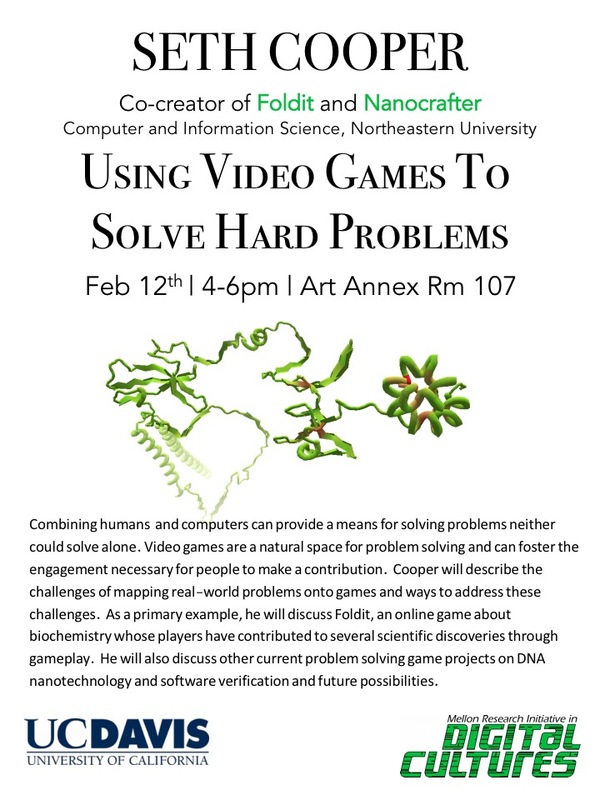 As a primary example, he will discuss Foldit, an online game about biochemistry whose players have contributed to several scientific discoveries through gameplay. He will also discuss other current problem solving game projects on DNA nanotechnology and software verification and future possibilities. Author Jonathan EisenPosted on February 9, 2016 Categories Misc.Tags Misc.